The transient killer whales moved up into the San Juan Islands for a couple of days, according to commercial whale watchers. Today, they were sighted at the south end of Whidbey Island. The transient killer whales that have been visiting Puget Sound for about a week may have moved up to the Whidbey Island area, where a group of about five orcas were reported yesterday and today. Swift and silent killer whales, known as transients, must be finding a good number of seals or sea lions to eat, because a group of a half-dozen or so of these animals appear to have been swimming around Puget Sound for about a week. This video was recorded this afternoon in Puget Sound by KOMO News. Although KOMO’s Web site does not say specifically where the whales were sighted, they were reported between West Seattle and Vashon Island. Orca Network’s recent reports include sightings of T87, 88, 90 and 90B south of Victoria last Tuesday. Later that night, transients were heard on the hydrophone off the West Side of San Juan Island. They stayed around the San Juans on Wednesday. Then on Thursday, they were spotted in Tacoma’s Commencement Bay and near the ferry lanes on the Fauntleroy-Vashon Island route. From a KOMO video that day, Dave Ellifrit of the Center for Whale Research identified T87, T88, T90 & T90B, plus the T30s (which may include a mother and two adult offspring). Since then, these same whales apparently have been spotted several times in Central Puget Sound. About halfway through the video above, it appears the orcas catch and kill a seal, evidenced by blood in the water. Transients are orcas that eat marine mammals rather than fish — the primary food of our familiar Southern Residents of the Salish Sea. Transients usually travel in smaller groups and seem to give residents wide berth when they come within range of each other. Transients roam widely from Alaska to California, though some stay farther north and others farther south. Because they hunt seals and sea lions, which can hear them coming, they are stealthier in their hunting than residents and appear to have a more limited vocabulary of vocalizations. According to estimates by biologists, transients generally need to eat an average of one or two harbor seals a day to maintain their caloric needs. In that sense, transients are friends to both resident orcas and fishermen, because they eat the animals that eat the salmon. In 2005, a group of six transients stayed in Hood Canal a remarkable 18 weeks, consuming a feast that amounted to an estimated 700 seals and sea lions. See Kitsap Sun, June 3, 2005. With the help of Orca Network, we’ll report where these animals go over the next few days. T-44, a 25-foot transient killer whale, was found dead Monday, floating off the north end of Vancouver Island near Port Hardy. 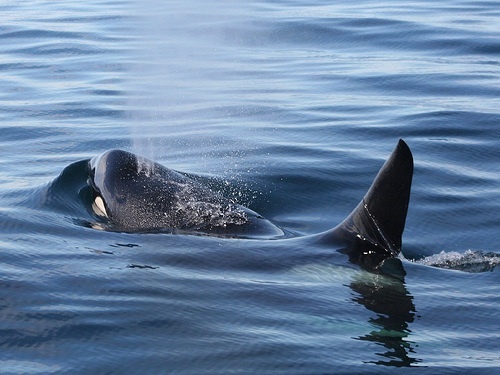 John Ford of the Canadian Department of Fisheries and Oceans said, for the first time in decades, researchers will be able study the biological and physical makeup of a transient orca. See report by The Canadian Press. Orca Network reports that T-44 has been observed in the Strait of Juan de Fuca and around Vancouver Island for years. With a nick in his dorsal fin, the animal was easy to spot, officials said. The Whale Museum in Friday Harbor offers this observation: “Hopefully the samples taken will identify the cause of T-44’s death, but a wealth of other knowledge can also be gained from recovering and necropsying a fresh killer whale carcass. For instance, the contaminant levels contained in the blubber and other tissues can be measured. Killer whales tend to carry high levels of POPs (persistent organic pollutants like PCBs and PBDEs) as they feed so high up the food chain and these contaminants can cause problems with their immune and reproductive systems. Rachael M. Griffin of Aquagreen Marine Research in Victoria put together a beautiful slide show in memory of T-44.